Menispermum canadense is a slender, climbing, woody vine to 5 m long. 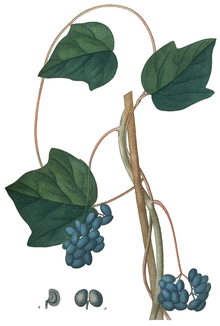 Leaves alternate, to 15 cm long, broadly egg-shaped, shallowly 5-lobed, tips blunt, veins palmate, margin smooth, leaf stalks inserted on underside near margin (peltate). 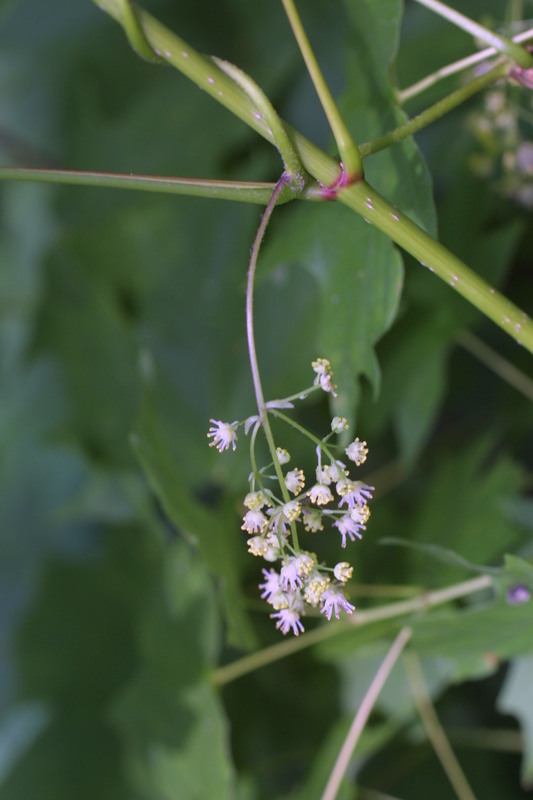 Flowers white, regular, small, in elongate clusters in leaf axils, June-July. Fruit fleshy, black, 1 cm in grape-like clusters, pulp lipid < 10%, apparently poisonous to humans (Kingsbury 1964); 1 seed, crescent or ring-shaped, irregular, flattened. Seeds animal dispersed. Fruits known to be eaten by Raccoons (Wilson 1993). Habitat: Open uplands and edges, sprawling over other vegetation. .